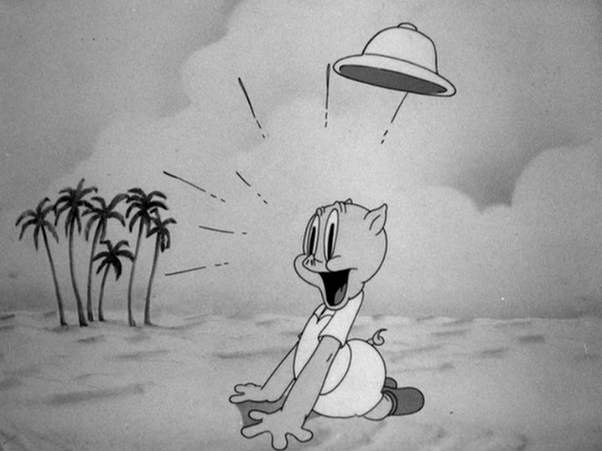 Porky Pig in an old episode of Looney Tunes. 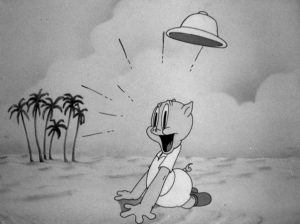 Hard to believe this one came out in 1938 – Porky in Egypt. Hallucinations are not just for Porky Pig. If you are as old as me, then you may well remember the old Looney Tunes cartoon with Porky Pig and his camel lost in the desert in Egypt, dying of thirst, wanting to cool down, diving into a seemingly real swimming pool. The camel fears the “desert madness” is upon them, but is relieved when another hallucination of a camel train saves them. But are these the only kind of hallucinations there are? No, not at all. And we don’t have to be going “mad” to have them. I have them every day in fact, not that I dare set myself up for being questioned on sanity! But, I will in fact share a bit about my own hallucinations, as well those experienced by others. My kitty Kinsey disappeared one night in about 2010. I still hear him call me from time to time. Another hallucination I occasionally have had stems from grief. 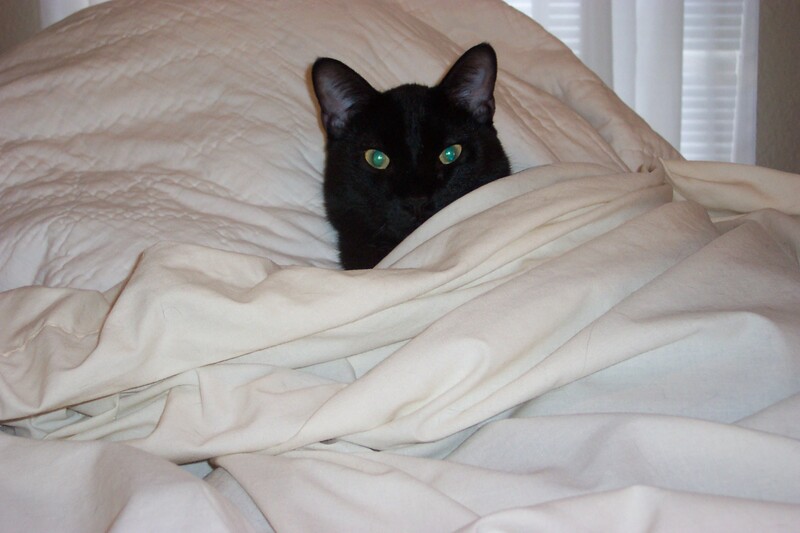 When I was divorced in 2005, I lived alone until I adopted a kitten from the SPCA in McKinney. I called him Kinsey after the detective Kinsey Millhone, star of the Sue Grafton alphabet mysteries. When he was about five years old, he went out for the night as usual, but never came home. I searched high and low, put out fliers, searched the neighbor hood. I was certain though he was stuck under the apartment building I lived in. I kept hearing him cry. My partner did too. But it wasn’t real, I was having a hallucination based on desire, and based on my need to adjust to the loss. I wanted to hear him so bad, I did. And the power of suggestion may have influenced my partner to hear him too. Every now and then, he calls out to me in my mind. He was my companion when I was grieving the loss of my marriage and we were quite close. Our brains record sounds and songs and store them away. Once in awhile, we get a “match” and think we hear them again. It is but a false positive though. It is another type of audio hallucination. The last type of hallucination I have had at least twice came in the night, right before waking. I have mild sleep apnea from a congenital deformation in my throat, as well as for being overweight. Occasionally when I sleep, I stop breathing. My throat closes and I begin to panic. Twice, a woman shouted at me, “Renee, wake up, you are going to die!” I jolt up with a rush of adrenaline. The yell hear is real, external, and not like a normal dream voice. These hallucinations saved my life. It is common for people to assume if you hear a voice, you must be going “psychotic” or you much be schizophrenic. This is hardly the case. Everybody pretty much hallucinates every night. Dreams are really quasi-hallucinations in that we think they are real, but they don’t usually have a true external quality to them. We generally know we are dreaming and if we thought it was real, we would likely wake up immediately. What I am trying to say is that “hearing voices” does not mean you have “desert madness”. But they d0 have many causes! 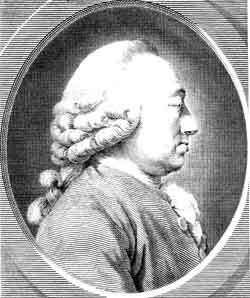 Charles Bonnet (1720-1793). Visual release hallucinations, also known as CBS, are complex visualizations in those with little or no vision. Charles Bonnet Syndrome (CBS). Charles Bonnet was a Swiss naturalist that lived in the 1700’s. He became interested in hallucinations when his grandfather, Charles Lullin, began seeing things when his eyesight failed. The things he saw were complex, such as a flight of pigeons, a group of dancing butterflies and men coming to greet him. Sometimes these hallucinations are in context, and other times nonsensical. Regardless, there is no control over them, they come and go at their own will. Other visual aspects of CBS hallucinations may include text, numbers, musical notes, dazzling colors, amazing detail, various shapes, duplicated items and immense elaboration. The CBS type of hallucination is related to eye disease or higher up in the visual system, such as due to reduced blood flow to areas of the brain. Treatment, Sacks says, has included using medication called quetiapine. Finally, unlike dreams that allude to the unconscious, hallucinations do not provide such insight. Drug Induced and Other Altered States.